The final stretch of the Donizetti Opera Festival is here with a weekend of eight different events. Once again, the days around the anniversary of Donizetti’s provide the celebratory occasion to bring the music of Bergamo’s most famous citizen to the city’s symbolic places. The last performances of Donizetti’s operas for this edition: the curtain of the Teatro Sociale reopens with the staging of ‘Il Castello di Kenilworth’ (Kenilworth Castle), on 30th November at 8.30pm and 2nd December 2nd at 3.30pm, the first of three works that Donizetti dedicated to Elizabeth I of England (also for this reason often known as ‘Elizabeth at Kenilworth Castle’). On this occasion, the Music Director of the festival, Riccardo Frizza, takes to the podium with an opera considered ‘legendary’ by fans, in a new revision by Giovanni Schiavotti, and under the direction of Maria Pilar Pérez Aspa. The vocalists include two divas of the belcanto, Jessica Pratt (in the role of Elizabeth) and Carmela Remigio (in that of Amelia), who were already protagonists in previous editions of the festival with extremely successful performances, and, as tenors, Francisco Brito and Stefan Pop. The sets are by Angelo Sala, costumes by Ursula Patzak, and lights by Fiammetta Baldisseri. On the podium for the Orchestra Donizetti Opera is Riccardo Frizza, with the Donizetti Choir led by Fabio Tartari. Then comes the turn of Enrico di Borgogna (Henry of Burgundy), on 1st December at 8.30 pm. This is the opera that marked the young composer from Bergamo’s entry into musical society, on the occasion of the opening, in 1818, of what is now Venice’s Goldoni Theatre. For this new performance, co-produced with Teatro La Fenice di Venezia, the direction is led by Silvia Paoli, while Alessandro De Marchi and his Academia Montis Regalis are responsible for the musical reading according to the critical revision by Anders Wiklund. For this rarity, the festival boasts leading vocal performers Anna Bonitatibus, Sonia Ganassi, Levy Sekgapane and Luca Tittoto, with the Donizetti Opera Choir directed by Fabio Tartari, scenography by Andrea Belli, costumes by Valeria Bettella, and lights by Fiammetta Baldisseri. The festival weekend is enriched by other events, such as Il volo del gufo: Donizetti e l’esilio (The flight of the owl: Donizetti and exile), staged on Saturday 1st December, at 11 am, at the house of Donizetti’s birthplace. The performance is a project by Quintetto Orobie, which, together with soprano Holly Czolaczche, have participated for a number of years in the Festival and on Donizetti Night, as well as proposing CDs, other concert events and narrated performances dedicated to certain aspects of the poetics of Donizetti. Also on Saturday 1st December, at 4 pm in Fondazione Carisma’s Fausto Begnis Auditorium, will be the free-admission show Gaetano, Gioppino e L’elisir d’amore (Gaetano, Gioppino and The Elixir of Love), with the puppets of Daniele Cortesi. 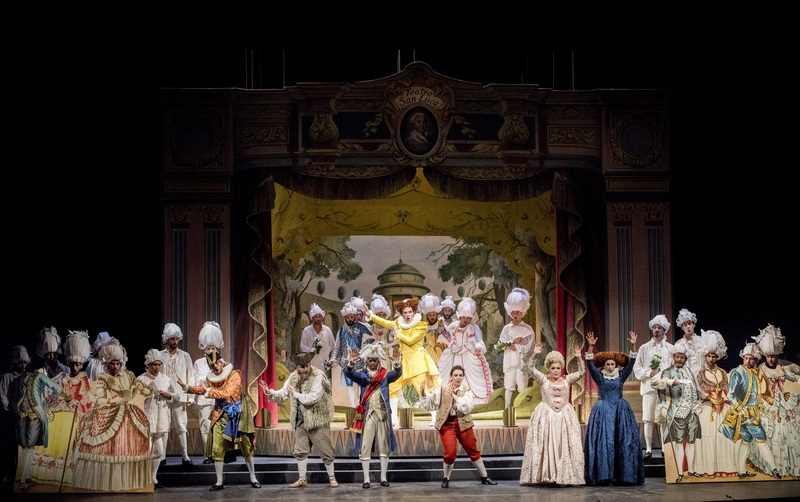 With great liberty and imagination, the show explores where the inspiration for ‘L’elisir d’amore’ may have come from, and posits a not impossible friendship between the composer Gaetano Donizetti and the figure Gioppino Zuccalunga, both from late eighteenth century Bergamo. Another event comes on Saturday 1st December, at 5pm, on occasion of the 70th birthday of Paolo Fabbri, the Scientific Director of the Fondazione Teatro Donizetti, with the presentation of a book dedicated to him. The book, Musica di ieri, esperienza d’oggi (Yesteryear’s music, today’s experience), will be presented in the company of Fabbri and the authors at Donizetti’s birthplace. Published by Libreria Musicale Italiana (Lucca, 2018), the work is a collection of 22 essays by other well-known Italian and European musicologists, curated by Maria Chiara Bertieri and Alessandro Roccatagliati, and partly dedicated to Donizetti. Finally, in addition to taking to the pit for Enrico di Borgogna (Henry of Burgundy), the Academy Montis Regalis will be the protagonist of two chamber concerts of music by Donizetti, Rossini and Mayr, on 30th November and 2nd December, at 11 am, at one of the most evocative historical residences in Bergamo, Palazzo Moroni, in collaboration with the DimoreDesign Festival.